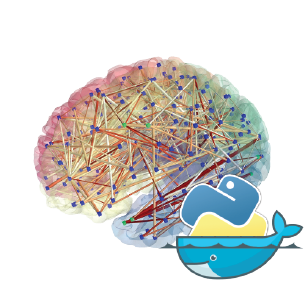 If you produce any connectome dataset that you want to share with the community, we provide a curated cffdata repository on GitHub. 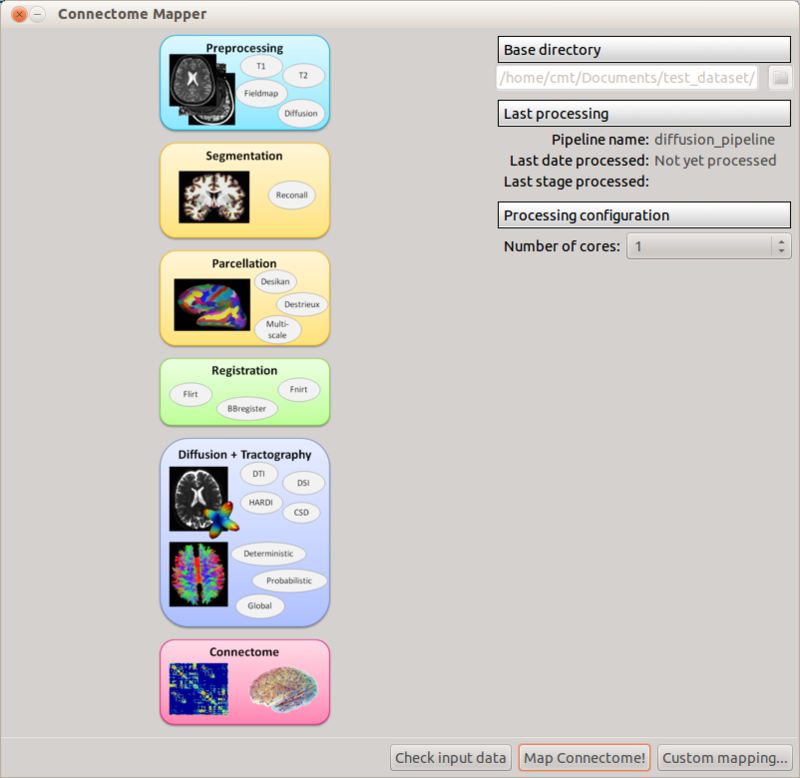 Running the Connectome Mapper opens the main window as well as a menu toolbar on the top of the screen. 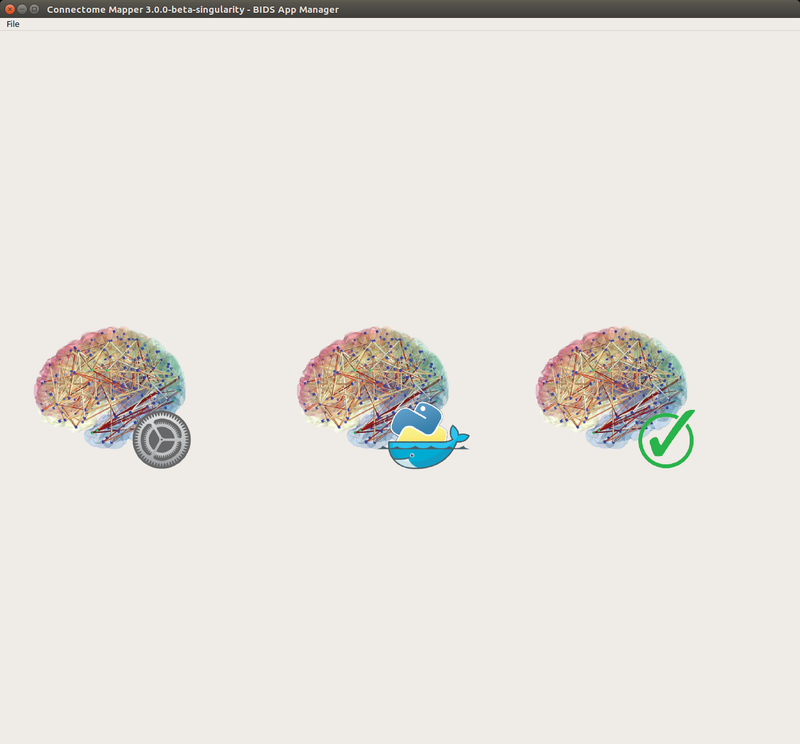 The only enabled buttons are in the toolbar: the “New Connectome Data…” and “Load Connectome Data…” in the File menu. You can also create the folder structure manually before selecting the base directory (existing folders won’t be overwritten). Copy the diffusion (DSI, DTI, QBALL/HARDI) and morphological (T1, T2) images (DICOM series or single .nii.gz files) in the corresponding RAWDATA folders. The T2 images are optional but they improve the registration of the data. Now you can click on “Check input data” button in the main window. DICOM sequences will be converted to nifti format and nifti files copied into the NIFTI folder. A dialog box will appear to confirm the successful conversion. If several diffusion modalities are available, you’ll be asked to choose which modality to process. Once the diffusion modality is set, configuration of the pipeline is enabled. You can configure the processing stages by clicking on the respective buttons on the left. Pipeline information as base directory and last processing information are displayed on the right. You can also set the number of cores for multithreading the pipeline processing. When the pipeline is configured, you can run the Map connectome! button. If you don’t want to process the whole pipeline at once, you can select which stage to stop at using the “Custom mapping…” button. When the processing is finished, connectome tables will be saved in the RESULTS folder, in a subfolder named after the date and time the data was processed. If you run into any problems or have any questions, post to the CMTK-users group. Configure the pipeline as described previously, and instead of running it, save the configuration by clicking on the “Configuration” -> “Save configuration file…” button in the toolbar. © Copyright 2018, Brain Communication Pathways Sinergia Consortium Revision 23d06479. © Copyright 2018, Brain Communication Pathways Sinergia Consortium. Last updated on Mar 08, 2019. Created using Sphinx 1.7.9.